National recognition is being sought for a triangular-shaped neighborhood that sprouted in the northeast corner of Buffalo as an urban subdivision in the early 20th century. 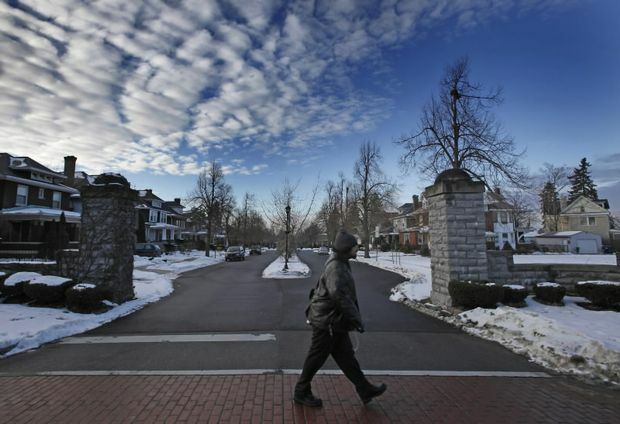 University Park, a slice of the city's University Heights neighborhood, was nominated for the National Register Historic District in November as part of a University at Buffalo class project. Supporters are hopeful the national status will be granted in the spring, after the application is reviewed by the National Park Service. "To be listed on the National Register is an honor," said Kerry Traynor, a clinical associate professor of architecture and urban and regional planning at UB. 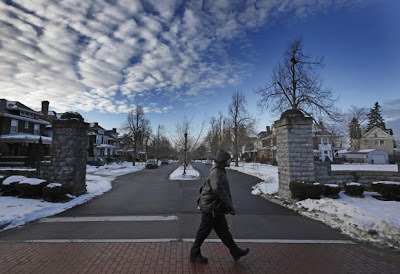 University Park is made up of 252 homes and a park on portions of Larchmont Avenue, Niagara Falls Boulevard, Radcliffe Road, University Avenue, Allenhurst Road, Pelham Drive and Capen Boulevard between Main Street and Kenmore Avenue. The neighborhood is ripe for the National Register, Traynor said, not necessarily for its Craftsman, Bungalow and Prairie Box homes, but for its planned design, which provided a gated, suburban flavor next to Main Street. "It really was a good example of early suburban planning," said Traynor, an architect and architectural historian, who owns the consulting firm, KTA Preservation Specialists. "It makes it an interesting component in the history of Buffalo." There are only 11 historic districts in Erie County recognized by the National Register, including Allentown, Delaware Avenue between North and Bryant streets, the Roycroft Campus in East Aurora and the Parkside neighborhood, which was designated in 1986. The idea of a University Park Historic District was first raised last spring as a possible class project in Traynor's historic preservation course at UB. Her students did the preliminary research and work assessing the properties. UB graduate student Annie Schentag further developed the project as an independent study, using the information to complete the lengthy, detailed National Register application. The University Park property was developed in 1913 by Anthony J. Huck, who wanted to capitalize on the purchase of land across the street for the university, Schentag said. University Park boasted wider streets, manicured medians, larger-than-normal setbacks and garages to account for the rising popularity of the automobile. The neighborhood's development continued throughout the 1920s and '30s. "It was sort of seen as this respite for this middle-class person who wanted to leave the crowded, crazy industrial City of Buffalo at the time," Schentag said. "What's really special is you can go there today and feel the sense of that pastoral environment." The process for seeking the national designation has the support of the City of Buffalo and the New York State Historic Preservation Office, which listed University Park on the New York State Register of Historic Places in early December. University Park homeowners seem receptive to the recognition, too, Traynor said. It opens up property owners to tax credits for rehabilitating their houses, Traynor said, but homeowners aren't necessarily required to restore residences to their original historic condition to be eligible. "We'll definitely do a project like this again," Traynor said. Other areas in the University Heights should also have the opportunity to research there particular neighborhood and apply also. This would be a great way to entice folks to buy property for the tax credit available for renovations. Property values would then increase and the number of properties acquired to be used as rentals would decrease. Living in one of the oldest homes in the lower Heights (1887)I agree-My home has a rich Buffalo Historical history with George Urban Jr. being a former owner..
My house is just as historical as ones in the "History Zone, but sadly falls just outside the border. The real issue with University Heights are the absentee landlords. Englewood is looking like a ghetto and getting worse by the year. Until the slumlord issue is addressed, all of our house values are at risk. agreed--please call 311 on these properties-one @ a time--I do, & see a slight improvement,they take in high rents & do nothing until someone complains--SO COMPLAIN--OFTEN--BE HEARD-THIS STILL IS A RESIDENTIAL NEIGHBORHOOD-WE HAVE THE VOICES TO MAKE A DIFFERENCE--DO SO! !